Joanna ('Jo') Spence (1934-1992), Photographer. Sitter in 3 portraits, Artist of 1 portrait. Joanna ('Jo') Spence (1934-1992), Photographer. Artist of 1 portrait, Sitter in 3 portraits. Diagnosed with breast cancer in 1982, Spence developed her own system of self-medication which included 'photo-therapy' sessions. In this self-portrait, Spence confronts us as grotesque, her face behind a hag-like mask. She is both scary and comic. 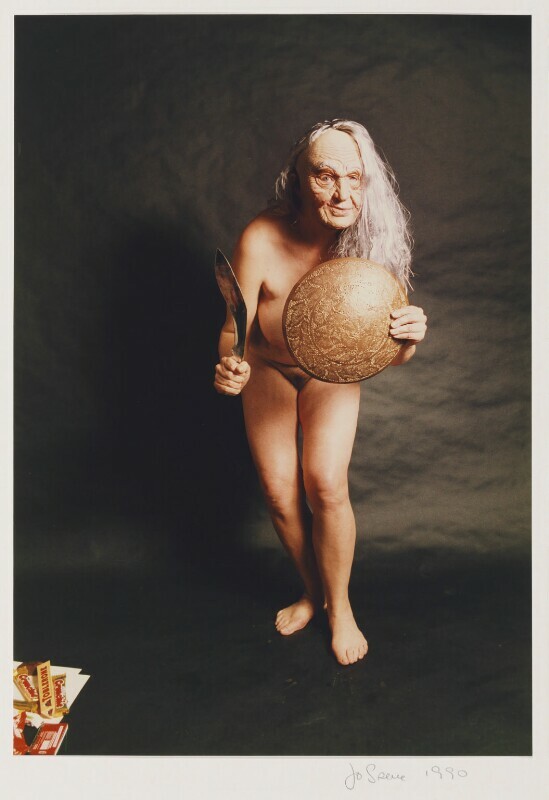 The photograph was originally the central image in a triptych used for a poster that advertised the exhibition Missing Persons/Damaged Lives at Leeds City Art Gallery in 1991. Margaret Thatcher introduces a Poll Tax. 'The Community Charge' replaced the old 'Rates' system of local taxation based on the value of property in favour of a flat rate for all householders. With little difference between the tax burden of the poor and the wealthy, opposition was bitter and violent. Following a challenge to her leadership Thatcher stood down as Prime Minister and was replaced by John Major. Tim Berners-Lee invents the World Wide Web. He created the first web-browser and editor, and the first web-server in 1990, building the first website and putting it online in 1991. By making his ideas royalty-free, Berners-Lee made the Internet accessible to all and allowed all users to help build its content. British beef is banned from schools and hospitals over concerns about BSE ('mad cow disease'). The Gulf War breaks out between Iraq and US-led coalition forces. War was declared after Iraq invaded Kuwait, and, following a period of UN economic sanctions against Iraq, hostilities commenced in January 1991. The coalition victory was swift and within three months Iraqi forces withdrew from Kuwait. Nelson Mandella is released from Prison after 27 years captivity.